American DJ’s new Flat Par TRI7 keeps a low profile, but that won’t stop this compact Tricolor LED par can from quickly becoming the talk of mobile entertainers, theatrical designers, clubs and other stage lighting users. Although slim in shape like its name suggests, the Flat Par TRI7 is brighter than many bigger par cans, armed with 7 amazingly brilliant 3-watt TRI (red, green and blue) LEDs. 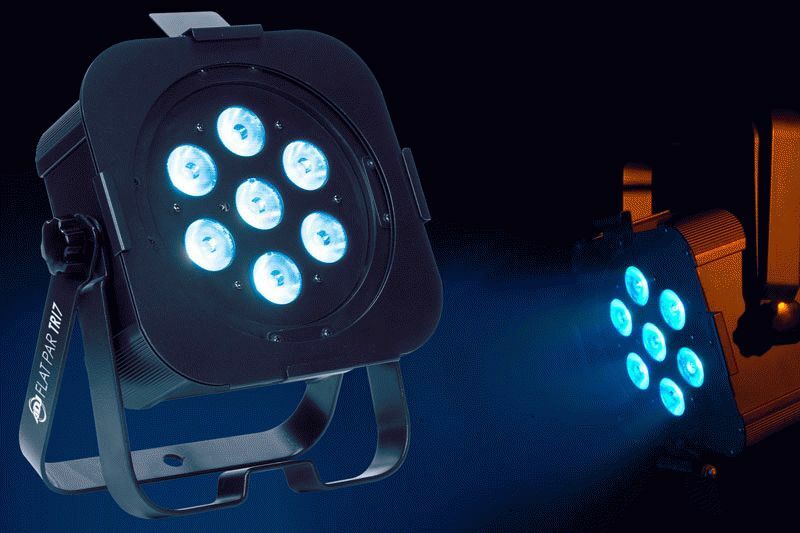 Not only do its high-powered LEDs blast out intensely brilliant light, the slender Flat Par TRI7 offers users a “fat” array of professional stage lighting tools. Featuring DMX-512 protocol, it can create an infinite palette of colors through RGB mixing, fade and change colors (fast or slow), strobe in any color, run through 32 built-in Color Macros, and dim electronically from 0-100%. And because it utilizes American DJ’s cutting-edge TRI-color LED technology, whereby each of its 7 lamps is comprised of a combination red-green-blue LED source, it blends colors much more smoothly than fixtures with single-color LED. Its TRI-color LED technology also eliminates the distractive shadows often produced by RGB fixtures, resulting in sharper, more vivid illumination on stage. The Flat Par TRI7’s slim case design makes it ideal for tighter spaces, smaller productions, and entertainers on the go. It’s also the perfect size to insert into truss for colored uplighting. “We saw there was a need for a smaller LED par can that was easier to transport and fit into truss and other tight spaces,” said Scott Davies, General Manager of the American DJ Group of Companies. “So we designed an LED par that has a unique ‘flat’ shape, which gives it great versatility and allows it to pack up and travel easily. Extremely versatile, the Flat Par TRI7 gives users the option of choosing from 6 different operational modes: Manual Color Mode, Color Change Mode, Color Fade Mode, Auto (Program Run) Mode, Sound Active Mode, and DMX-512 Mode. When used with a DMX controller, operators can further select from 7 DMX channel modes: 1, 2, 3, 4, 5, 6 or 7 channels. A 4-button LED display on the rear panel makes it easy to scroll through the DMX menu and settings. The Flat Par TRI7 can also be linked in multiples and run Master-Slave via 3-pin XLR cable. Another of the Flat Par TRI7’s very useful features is its ability to be run wirelessly via American DJ’s LED RC infrared remote controller (sold separately). Using the wireless LED RC unit, operators can be as far as 15 ft. away from the par can while controlling such functions as Blackout, Program Selection, Auto Run through built-in programs, Strobing, Speed, DMX Addressing, DMX Mode selection, Sound Active Mode selection, and adjustment of RGB colors. Featuring a 40° beam angle, the Flat Par TRI7 includes a gel frame for optional diffusion filters. It comes with a versatile dual-bracket system that allows the fixture to either be hung or set on the ground. A safety hook on the rear panel prevents accidental slippage. The Flat Par TRI7 also includes IEC AC In/Out outlets on the rear to daisy chain power, and multi-voltage operation: AC 90V-240V 50/60 Hz. Despite its great brightness, the Flat Par TRI7 won’t emit much heat on stage, thanks to the cool operation of its LED lamps. It can be run all night without overheating, eliminating on-off duty cycles, and you can pack it up right after the show – no waiting for a cool-down period! This LED-powered unit is also much more energy efficient than its conventional par can counterparts, consuming only 25 watts of electricity at maximum draw. The Flat Par TRI7’s slim case measures 10.75”L x 9”W x 4.25”H/ 272 x 230 x 105mm. Easy to transport, the unit weighs just 7 lbs./2.8 kg. The MSRP of the Flat Par TRI7 is $279.95.